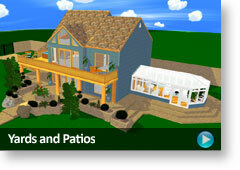 Design Your Dream Home, Remodel the Kitchen, Landscape the Yard, and Add Furniture Too! "Let me start by saying that I am new to plan 3D and completely hooked! 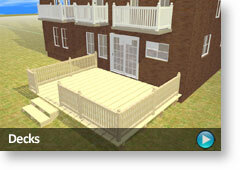 We are having a home built... re-creating the floor plan with plan3D has been incredibly helpful. The kids tease me and say now Mom has her own video game!" 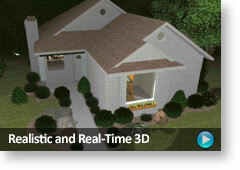 "I'm completely hooked on plan3D and highly recommend it to you! You will not believe how easy it is to draw up a new plan..."
"Laying out my kitchen appliances and cabinets couldn't have been easier! Cabinets and appliances snap together. It's amazingly realistic - even the refrigerator and cabinet doors open and close. " "...a big thank you for a wonderful program! I've designed the house of my dreams and impressed my architect! He had no idea what... I wanted until I was able to show him! How fantastic is that!" Our home design tool was made ultra-easy for homeowners because you have better things to do than learn complex architectural software. See our Huge Home Gallery. You get free access to every one of our thousands of 3D sofas, chairs, desks, patio furniture, tables, cabinets, appliances, windows, and doors. Many are animated with the click of the mouse (like the refrigerator.) Change the size and dimensions of any object. 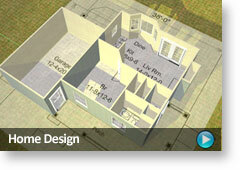 If you're looking for a home design tool you can use without taking hours to learn - you've come to the right place. 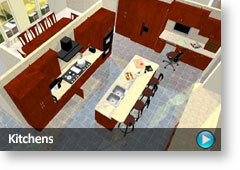 Design one room or an entire house with doors, walls, windows, bathroom fixtures, cabinets and roofs. 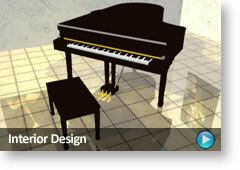 As you design you'll see your ideas in realistic 3D with lights, shadows and reflections. 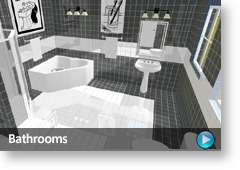 Remodel your basement, kitchen, or bath. Decorate any interior with paint, furniture, and flooring, or go all out and design a five story dream home from attic to basement. 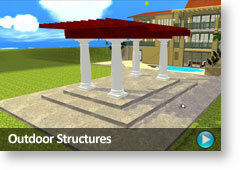 Use Plan3D to trace floor plans and do 3D walk throughs to see how your plans will really look. Is the closet big enough? Is the hallway wide enough? 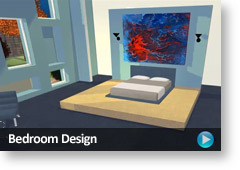 Will the bedroom set fit in the guestroom? Now you can see exactly what you're going to get in advance. If you're busy - that's ok! We'll convert your plans for you! Get your free estimate today. Any laptop or desktop with Windows 10, 8, 7, XP, or Vista.